The Phoenix Lite is an affordable lane machine designed specifically for smaller centers. 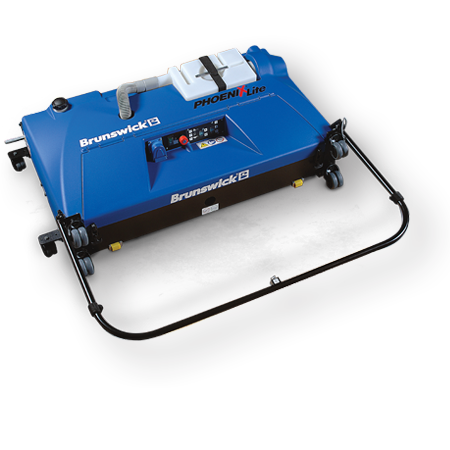 Reliable and easy to operate, this combination machine cleans, oils and buffs in a single pass. With Phoenix Lite, you’ll find that access to liquids is easy with cleaner and waste tanks right up top. A floating vacuum head fits the contours of your lanes to maximize cleaning and setting the desired oil pattern is nearly fool proof with the color-coded foam selection system. Oiling and buffing distances are also simple to program on the digital keypad. Reliable optical sensors even detect the end of lane and foul line markings. Efficient and cost effective, the Phoenix Lite really is a great solution for any small center’s lane maintenance needs.